ArmorPoxy has the products you need to strengthen and restore your pool deck for increased durability. 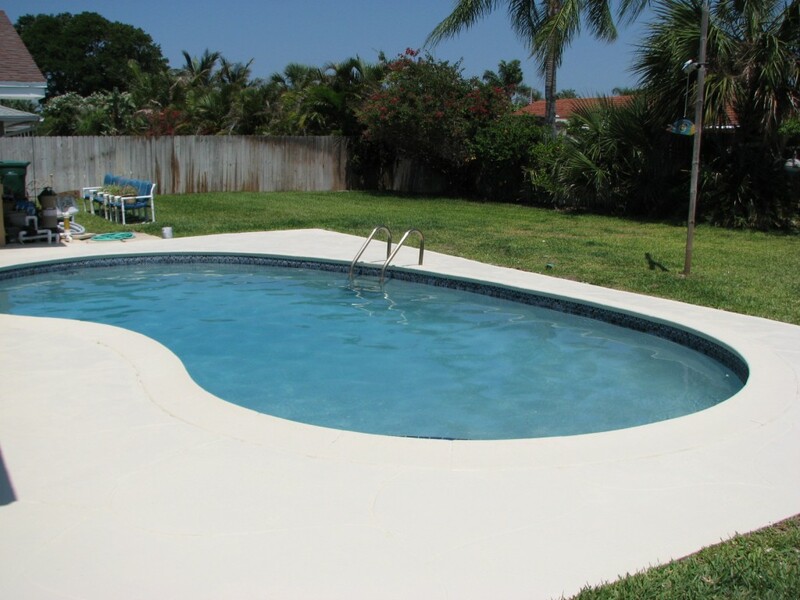 Often made of concrete, pool decks are subject to noticeable fading, indents, and cracking that can start to detract from the overall look of your pool area. Something even more problematic, as cracks and other flaws, grow over time, it can put you, your family, or your guests at risk for injury, especially with a slippery surface. It’s essential that a high-quality pool deck coating is used to protect against damaging UV rays, surface imperfections, and more. ArmorPoxy has the products you need to strengthen and restore your pool deck for increased durability. Our ArmorRenew Wood and Concrete Resurfacer is the perfect option for those looking to revamp their pool deck area quickly. This specially formulated epoxy coating, one of the leading pool deck resurfacing products on the market today, is formulated using our proprietary resins, concrete and stone powders, and epoxy bonding agents. The resulting coating creates a strong, slip-resistant surface that hides existing imperfections and protects against new ones. Heavy use of the pool deck area will not result in visible signs of wear and tear, and slips and falls will be noticeably less frequent. Easily applied to decks and patios and similar outdoor areas. ArmorTop is a unique one-part roll on coating that is ideal for patios, pools, walkways, commercial areas and similar high-traffic surfaces. Can be used on asphalt and concrete. Easy to apply, low-odor and can be field tinted easily. Available in both Smooth and Textured versions to reduce slippage when wet. Commercial-grade, used in them parks, commercial pool decks and similar applications. ArmorStone is our innovative “roll on stone” system. What makes ArmorStone so unique is that the liquid coating is infused with ground stone. This deck coating not only gives your pool deck a gorgeous and expensive look, but it also provides a safer, non-skid surface to maintain safety by the pool as a priority. The best part is that you’re able to design a pool deck that is cohesive with your entire outdoor space, and by using faux painting techniques and some tint, you can make ArmorStone look like virtually anything. ArmorStone pool deck coatings can also be tinted any color of your choosing, so you’re sure to create a surface you’ll love. Installing an ArmorPoxy pool deck paint or coating will significantly reduce maintenance time to your pool deck, making cleaning a breeze. Contact us today to discuss the possibilities for your new pool deck!